A photo essay on the ground outside the mega-retailer’s store in Richmond, California. RICHMOND, CA—This city just north of Oakland was ground zero for the Black Friday protests at Walmart, as two international union presidents and one of the most pro-labor voices in Congress joined fired workers and some still employed, and several hundred of their supporters. At one point, Service Employees International Union (SEIU) President Mary Kay Henry (below left) and Rev. 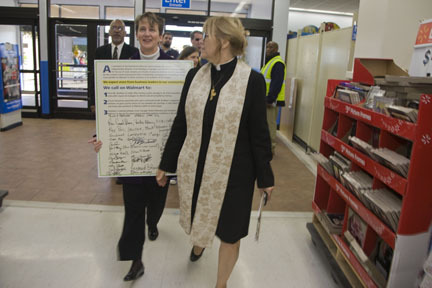 Carol Been (right), senior organizer for Clergy and Laity United for Economic Justice, led a delegation into the store to present its manager with a petition demanding the rehiring of fired workers, and respect for the right of all workers to freedom of expression and organization. The manager refused to accept it. 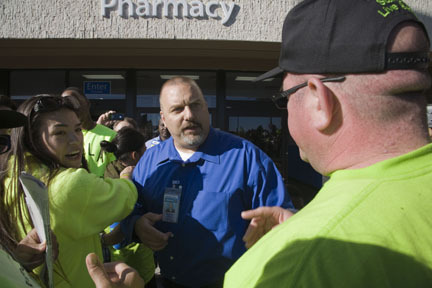 Meanwhile, fired workers themselves angrily confronted Walmart officials, supported by a handful of those who were still employed and had clocked out in order to participate in the protest. “I was fired because I protested the racist remarks of a store manager,” declared Misty Tanner. 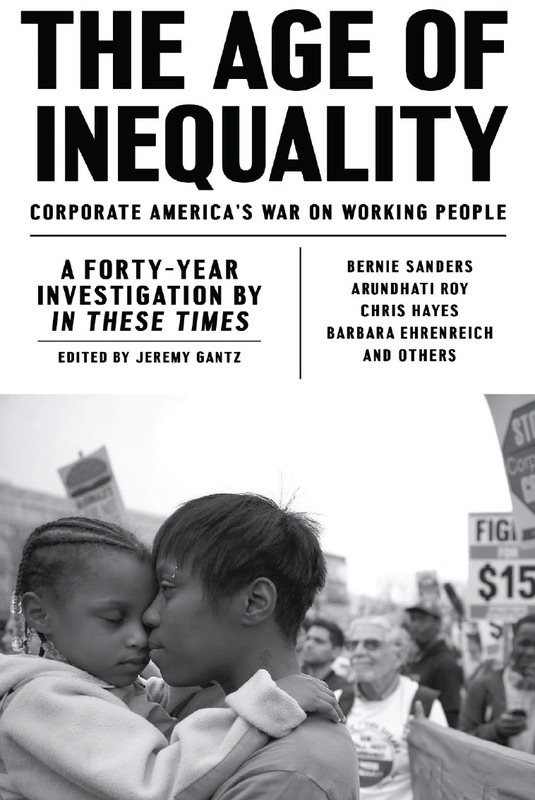 According to SEIU, when an African-American associate used a rope to move merchandise, one interim manager told him, “Leave it up to me, I'd put that rope around your neck.” Subsequently, when a different Walmart worker was speaking with members of the news media, the same manager threatened to run her over with his car. Tanner worked for four years at the Richmond store that was targeted by the demonstration, most recently on a night crew doing renovations. She says she was suddenly told that there was no more work for her, despite the fact that renovations continued afterwards. Managers refused to comment on her case or make any other statement. 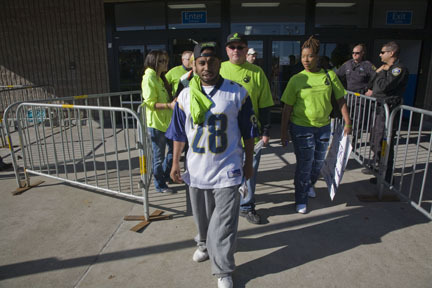 The Richmond protest was organized by the Organization United for Respect at Walmart, or OUR Walmart, and the group's green t-shirts were omnipresent in the crowd. 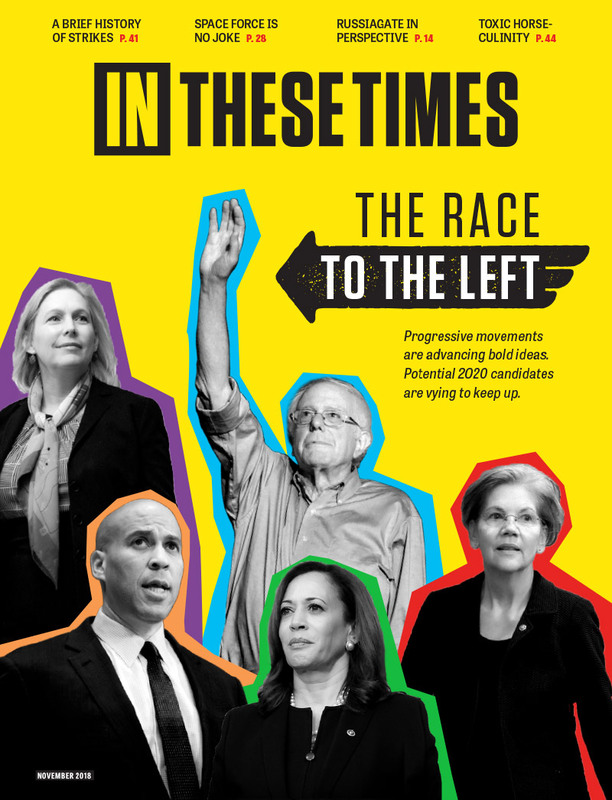 While supported by the United Food and Commercial Workers (UFCW) and other unions, it is an autonomous workers' association, according to the Walmart workers themselves. 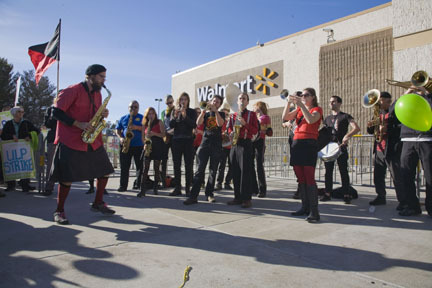 In the days prior to Black Friday, Walmart filed charges with the National Labor Relations Board (NLRB), alleging that the UFCW and OUR Walmart were organizationally tied, and that the union had violated the law by conducting recognition strikes for longer than 30 days without filing for an NLRB representation election. Walmart's NLRB complaint, calling the work stoppages illegal, seemed an effort to head off worker participation in the protests, which were timed to appeal to customers on the single biggest shopping day of the year. Big retailers like Walmart rely on the day after Thanksgiving to kick off the holiday shopping frenzy. In response, OUR Walmart, according to organizers, protested at more than 1,000 stores in 46 states. Bill Simon, Walmart's president and chief executive officer, said in a statement that “only 26 protests occurred at stores last night [the evening before Black Friday] and many of them did not include any Walmart associates. We had very safe and successful Black Friday events at our stores across the country and heard overwhelmingly positive feedback from our customers,” he said. He might not have heard from Richmond managers, however, since that store was almost empty for hours, and many customers turned away after associates outside explained why they were there. 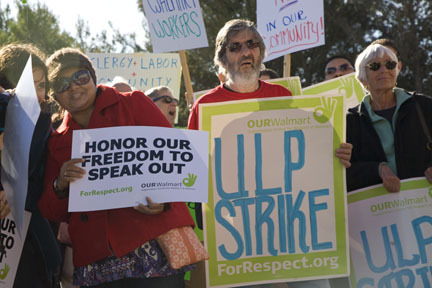 Community supporters hold placards announcing that the actions of Walmart workers in stopping work constitute a “ULP Strike”—that is, a protest over Walmart's “unfair labor practices” against workers for their collective activity in OUR Walmart. 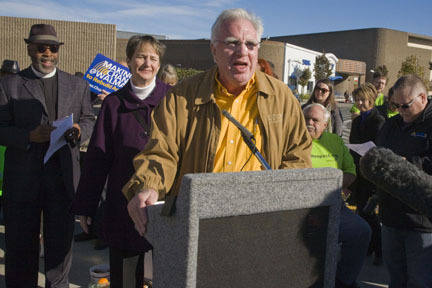 Joe Hansen, president of the United Food and Commercial Workers, speaks at the rally outside the store. Raymond Bravo (right), an associate still employed in the Richmond store, tells a store manager that Walmart should rehire the workers it has fired. 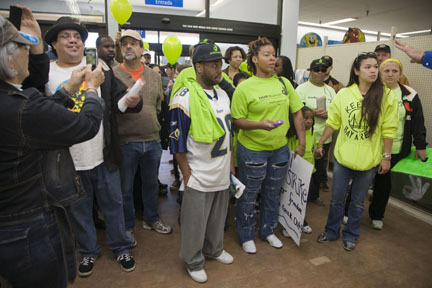 Workers walk out of the store entrance after making their demand that Walmart rehire those who have been fired. 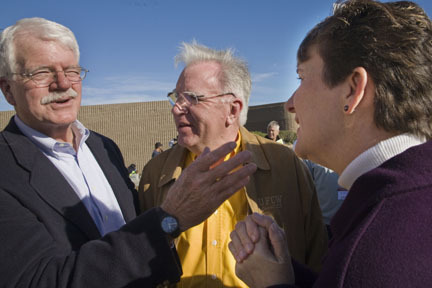 Rep. George Miller (left) talks with SEIU President Mary Kay Henry and UFCW President Joe Hansen. The Liberation Brass Orchestra plays outside the Richmond store during the protest. 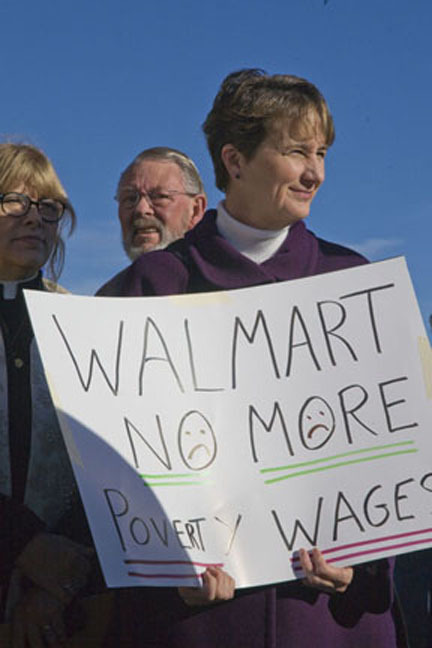 SEIU President Mary Kay Henry holds a sign supporting the desire of Walmart workers and Richmond residents for better wages and benefits at the retail chain.